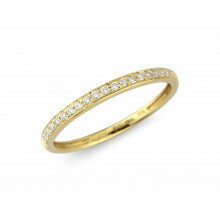 A beautifully classic Yellow Gold Ring with round brilliant cut Diamonds set along the top half of the band. The Ring has flat, slightly squared sides to give a pared down, clean look and has a sleek polished finish to enhance the sparkle. A fabulous Eternity piece to be worn alone or teamed with other rings from our ranges. Also available in Rose or White Gold.